Analog Studio Rack is a "Modular Rack" that provides hot-swappable 500 series style EQ’s, Compressors, Gate, Exciter and a Tube Driven Pre-Amp; the perfect all-in-one channel strip! Inspired by a classic and famous British console for its Gate/Expander, Comp/Limiter, Bus Compressor and EQ, a modified Exciter, a Tube Driven Pre-Amp and another famous mid 1950's EQ, the AS-Rack brings together a suite of 7 modules expertly tuned to sound musical. True analog in the box! Each of the 6 main modules can be placed in any order with simple drag and drop, allowing you the freedom within a rack space design to try different combinations; Compressor before or after EQ, Gate after a crushed Compressor for effect... All of this is now possible to customize your tone and source material, with various views available per module for gain reduction, spectrum and 1/3 octave. The plug-in comes with an array of presets specifically designed for various instruments as your starting point. 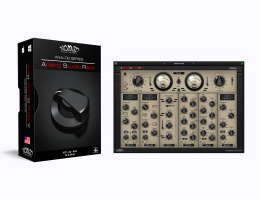 Utilize them in your mixes, tweak, create your own as single module presets or global.